There are several things to consider before working from home. If you plan strategically, you can create a full-time job that will allow you to stay at home and still have an incredibly lucrative career. It's important that you take a few things into consideration to judge is working from home right for you before you jump into a home-based business. You need to have an office that is strictly for your business. You can convert an extra bedroom or build a room in a section of your garage, but you need to be able to establish set boundaries that allow you to work in a quiet environment. You need to have a marketing strategy that will allow you to let others know you are available. Building your business takes time and effort so be prepared to go out and introduce yourself to potential clients. You need to continue growing your business. Once you start to build a client-base, ask them to refer their friends and colleagues. Don't be afraid to make a few cold calls to people you think may be interested in your services. You won't know until you try. Aiming to secure one new client from every ten cold calls is a good start. Make sure you have reliable equipment. Even if you purchase a few pieces that are used, it's fine as long as you can rely on them to get the job done. Once you are more established, you can start to upgrade your equipment and buy newer more efficient models. Don't allow yourself to get overwhelmed. Set reasonable goals and work toward each one on a daily basis. Set smaller goals that lead to bigger ones. This allows you to celebrate the smaller milestones. Establish a solid family/work balance so that everyone understands that during business hours, you may not be fully available. Working from home allows you to work around your family's schedule giving you more time with the kids when they are home. Working from home with your toddlers around can get very challenging at times. Fortunately, there are ways to simplify your responsibilities. This video takes a look on that. One of the most important things to consider before working from home is whether or not you can maintain a consistent schedule. When you work in an office, you know when you have to be there and when you can leave. Working from home means that you must be disciplined enough to maintain your own schedule. Just as in any type of career, if you want to be a true success you need to have a support system who understands what you need to keep your business going. Have your spouse and your kids create a chore list so they can take part of the responsibility around the house. This frees up your time to do your work and keep your business up and running. Consistently meeting deadlines is an important part of any home-based business. Make sure you know how to prioritize your time so that you don't have to rush through your work. Create a schedule that includes a few breaks that will allow you to take a breath and come back refreshed. Don't allow yourself to get burnt out. Take at least one day off every week so you can rest and take your mind off of work. Learn more about how to stay productive during your vacation. There are several things to consider in deciding how to make working from home work, but when everything has been looked at, it is a choice that offers many rewards. Mahesh is the spokesperson of the Transcription Certification Institute, an Ellensburg, WA based company that provides comprehensive online general transcription training certification courses. 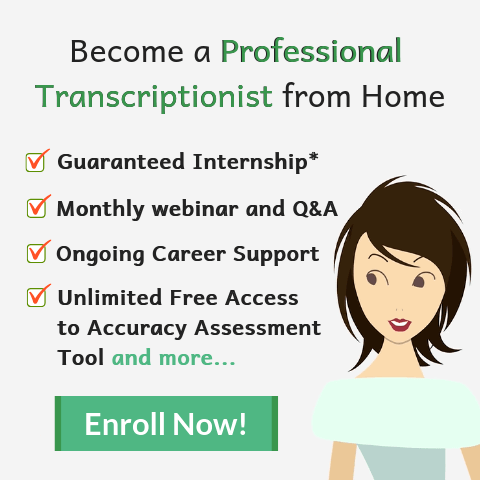 This transcription certification course facilitates careers in transcription because it provides a guaranteed internship with a major transcription company upon certification.